Members of The Boys’ Brigade from across the UK joined 800 other children and young people from across the UK at the Commonwealth Service in Westminster Abbey, in celebration of Commonwealth Day. Her Majesty The Queen, Head of the Commonwealth, attended the service on 13 March, accompanied by TRH The Duke of Edinburgh, The Prince of Wales, The Duchess of Cornwall, Prince Henry of Wales, The Duke of York and The Earl of Wessex. High Commissioners and dignitaries from across the UK and around the Commonwealth, senior politicians and faith leaders were also present. The Service celebrated the 2017 Commonwealth theme of ‘A Peace-building Commonwealth’, reaffirming the Commonwealth Charter principle that "international peace and security, sustainable economic growth and development and the rule of law are essential to the progress and prosperity of all". Bill Stevenson, CEO, The Boys’ Brigade also attended the service. 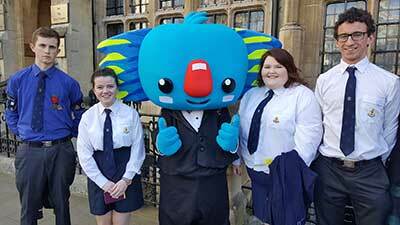 He said: “The group of BB young people from across the UK did a super job representing the organisation at such a prestigious event. Dame Jessica Ennis-Hill, DBE and Ms Fadumo Olow, a young Muslim woman from the Youth Sport Trust, processed The Queen’s Baton to the High Altar with Commonwealth athletes Anna Meares OAM and Kurt Fearnley OAM. The audience enjoyed performances by Australian musician, Cody Simpson, British spoken-word performer, George the Poet, and Canadian Soprano, Measha Brueggergosman. The event was broadcast live on BBC One and relayed live on BBC World Service. PHOTO: (from left) Jon Rodgers, Cabrini Brown, Lucy Mawhinney and Tom Baird.